Kevin Raye took to the airwaves Friday with a third TV spot, and this time he's going negative -- sort of. Kevin Raye took to the airwaves Friday with a third TV spot, and this time he’s going negative — sort of. Raye, the Republican state senate president from Perry, is challenging Democratic incumbent Mike Michaud in the Nov. 6 election to represent Maine’s 2nd Congressional District. The 30-second spot features two older women comically bemoaning a perceived shift in Michaud’s values during his five terms as a congressman. “The new ad is a humorous, honest and homespun look at the fact that congressman Michaud may be a nice guy, but when Mainers look at his record … it is clear he is no longer one of us,” campaign manager Robert Caverly said in a news release Friday. The ad calls into question Michaud’s decision to lease a hybrid SUV, his votes in favor of the Affordable Care Act, his low rating from a small business association and more. Toward the end of the ad, one of the women plays with Michaud’s image as an everyday Mainer. “If congressman Michaud is one of ‘us,’ I would hate to see one of ‘them,'” she says. 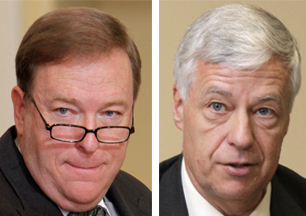 Dan Cashman, campaign spokesman for Michaud, said the ad marks a turning point in the race. Two polls in September showed Michaud with a double-digit lead. Cashman said Michaud has a successful record of supporting small business, manufacturers and farmers in Maine. “That seems to be resonating with voters from what we can tell,” he said. Mark Brewer, a political science professor from University of Maine, said negative ads can be a positive step for voters. He added that Raye’s ad could have been stronger if it contrasted Raye’s record with Michaud’s. On Tuesday, Michaud launched his second ad. His latest, which combined some footage from the 2010 campaign, shows Mainers vouching for Michaud’s character.